Figure 2 Model comparing main biogeochemical processes between (a) unpolluted and (b) organically enriched sediments beneath intensive fish farms. 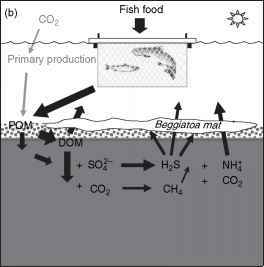 (a) Normal biogeochemical processes involved in the degradation of particulate organic matter (POM). Intensity of gray color indicates reduction of redox potential (Eh) from oxygenated upper layer (~300 mV), the aerobic-hypoxic interface (~100 mV, dotted line), to highly reduced deeper strata (< 200 mV). POM is hydrolyzed by detritivorous activity and extracellular hydrolytic enzymes in the aerobic zone, producing dissolved organic matter (DOM) that either is released in seawater or is biologically degraded. Most of DOM is mineralized aerobically or by nitrate-respiring anaerobic bacteria while a smaller fraction is oxidized by the next less-primordial oxidant at lower Eh value. Residual chemicals in deeper sediment strata (Mn2+, Fe2+, S2 , or methane), plus a fraction of proteolytic ammonium, become oxidized by chemoautotrophic bacteria. (b) Organic wastes of intensive aquaculture form a flocculent POM layer over the seabed, which acts as a source for a strong flux of DOM toward both water columns and deeper strata of sediments. Oxygen and nitrates become exhausted by the raised bacterial demand for DOM degradation, and most of DOM becomes oxidized by sulfate-reducing or methane-synthesizing prokarionts. The raised fluxes of ammonium and H2S and the scarce availability of oxidants for its biological re-oxidation allow its emissions towards the water column. Sediments become covered by white bacterial mats (Beggiatoa sp.) utilizing sulfide as energy source requiring oxygen and nitrates, reducing the penetration of these oxidants into sediments. Under severe organic enrichment, CH4/H2S upwelling bubbles become frequent. 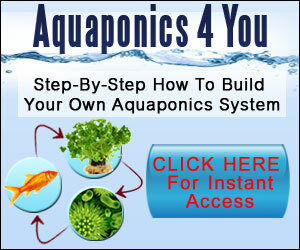 appropriate water flushing and sufficient depth prevent waste deposition that reduces water and bottom quality. If culture sites do not offer good water circulation, the installation of submarine blowers to dilute the residuals can be used. Other ideas, such as cages attached to single point moorings, allow the cages to maintain a 'watch circle' where the position of the cage depends on the sum of current and wind forces and, therefore, the accu mulation of organic matter is dispersed. In all these approaches, wastes remain in the environment, hoping that 'dilution is the solution'. Nevertheless, nutrient loading in coastal areas has become a major environmental issue worldwide and, for this reason, increasing the outputs of wastes into coastal zones is not an alternative anymore. In cases where aqua culture activity is low, and the farm size is reduced with each farming location well interspersed, it is possible that nutrient loading would be appropriate. However, it is not a suitable alternative for cases where intensive aquacul ture activities have developed over large regions (Figure 1). In these situations, different collecting acces sories that are attached to the bottom of the culture systems have been tested to reduce and extract the organic rich sediments produced by fishnet pens. Further, the pumping of organic sediments from the bot tom of areas affected by aquaculture practices by remote operated vehicles (ROVs) has been attempted. The time requirements for these technological alternatives and their operating costs have limited their implementation at the commercial scale. Fed aquaculture practices have also been blamed for promoting overfishing because of their dependency on FMO. Rising FMO prices and restricted future availabil ity have increased research efforts in finding suitable substitutes. Terrestrial plant meals and oils have been especially investigated. From a nutritional perspective, this research shows promising results, but from a waste perspective this is just another type of waste output being generated. It is well known that herbivores are less effi cient at transforming ingested food and, therefore, produce a greater amount of waste per kilogram of bio mass produced. Progress in fish nutrition states that terrestrial plant based feed could reduce the FMO demand, and food efficiency of the cultivated species in aquaculture could be managed. Thus, transforming carni vorous fish into vegetarian organisms is taking place, but the final impact of biotechnology on aquaculture waste reduction is still not clear. It could also be of interest to investigate marine plants as a source of feed, hence avoid ing costly irrigation of terrestrial crops. Offshore aquaculture has been proposed as a means to avoid coastal conflicts, with respect to both environmental impacts and multiple user conflicts. By moving offshore, dilution increases and should permit an adequate disper sion of wastes. However, the term offshore aquaculture is still ambiguous, with some confusion on whether it is really the distance from the coast that is important or the degree of exposure. However, this alternative will not reduce waste emissions toward the environment; it will just move it somewhere else and will also allow the expan sion of flow through aquaculture practices. especially predators like sea lions, seals, and birds, which are also attracted to farming areas, and may increase risks. The development of artificial reefs at farming sites is another step ahead in developing ecological engineering tools for reducing aquaculture wastes. Artificial reefs could become a very powerful tool as they provide habitat for a diversity of organisms that would provide different ecological functions and services. This could be especially important if extracting organisms create a significant bio mass. However, as reefs are placed on the bottom, where the water quality is reduced, light limitation for algal growth will occur, and for this reason reefs do not neces sarily imply an increase in biofiltering capacity and require to be tested.